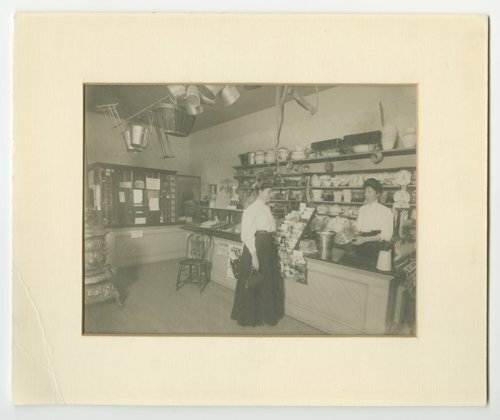 This is a photograph showing Mary Elizabeth Blunderfield Jolitz looking at a pail offered by her sister Emily Alice Blunderfield at their store in Talmage, Kansas. William Henry Blunderfield started the store for his daughters where they sold miscellaneous merchandise including china, pits, pans, dolls, toys, and baby carriages. One of the store's corners was a post office and Mary served as post mistress until she married in 1907 and after she left, Emily served in that capacity for fifteen years.